​Educating and communicating is what we're all about. 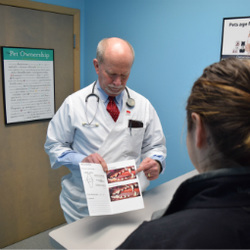 We talk with you about nutrition, parasite prevention, vaccine needs, dental hygiene and behavior issues during every wellness visit - just a sample of the topics we feel are important for proper preventative healthcare. After all, we rely on you to provide the best home care for your pet. It's our job to listen to you and answer all your questions - both in sickness and in health. Our doctors are available to talk directly with you during daily phone times. Give us a call!